How have I never made this before?? I mean it’s great for a fun & easy Friday night dinner, fabulous on a big tray while hosting a football watching party, or even an awesome way to get your kids in the kitchen cooking with you! 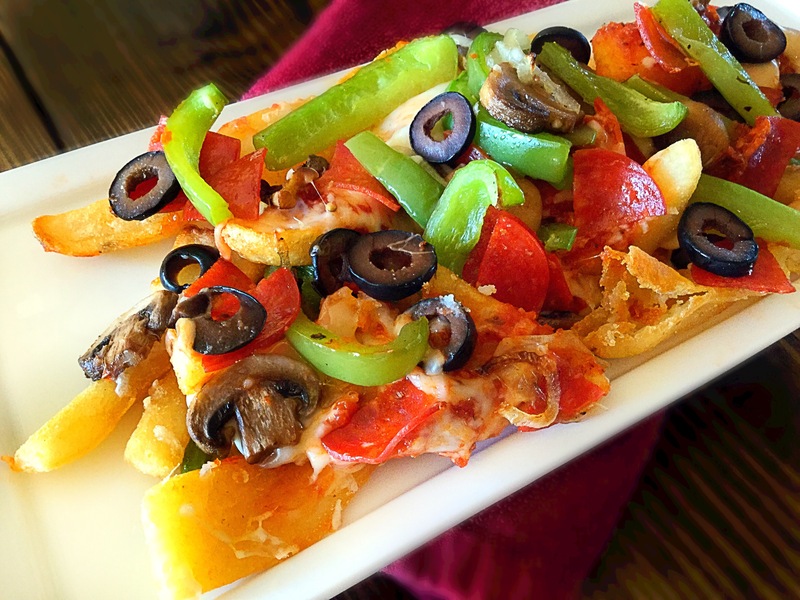 Really, what kid or even adult dislikes pizza or French fries? Combine the two and it’s a sure fire winner! 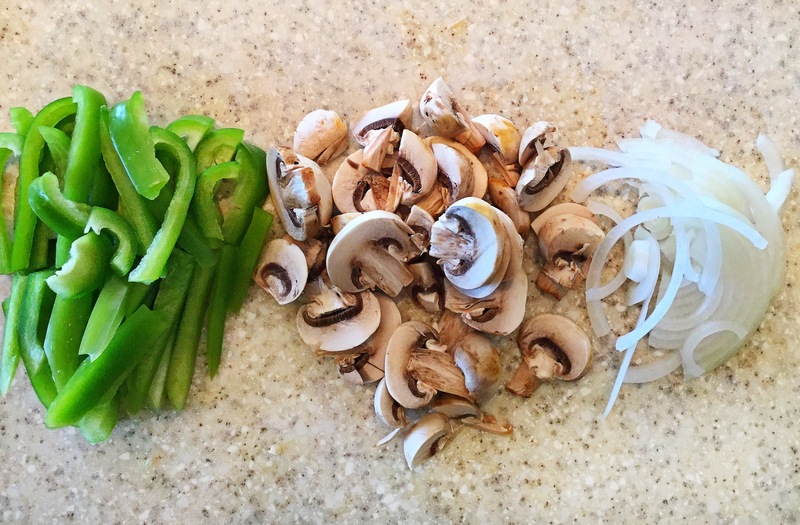 Plus, the toppings are endless! Now here I went the traditional ‘supreme pizza’ route, but what if your favorite pizza is Hawaiian? Sausage? Salami and hot peppers? Pick your poison and I’m sure you won’t be disappointed! 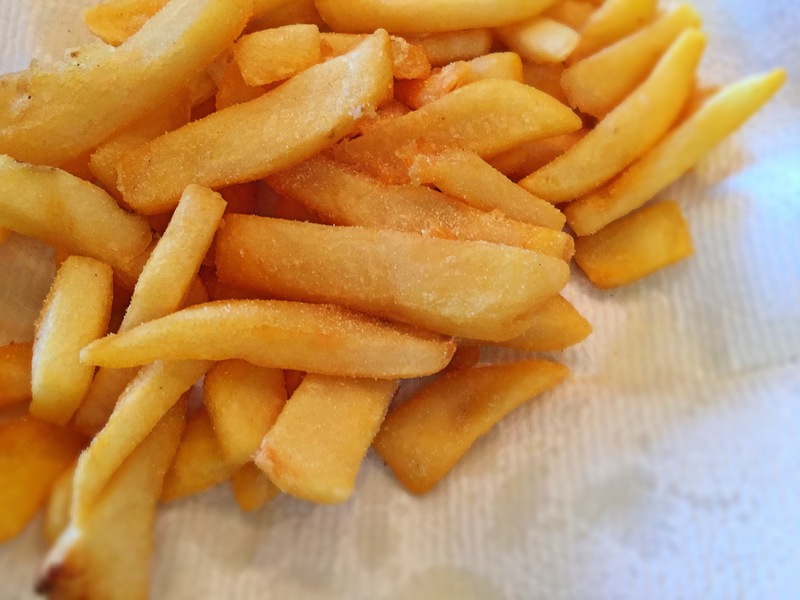 *If your making your own French fries, make SURE to soak the cut potatoes in a large bowl of cold water in your refridgerator for at least 1-2 hours, if not longer, prior to frying them. 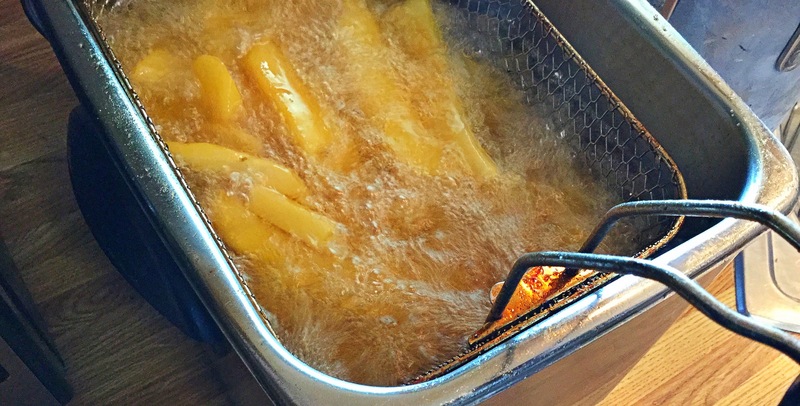 This removes a lot of the starch from the potatoes, resulting in crispier restaurant style fries! 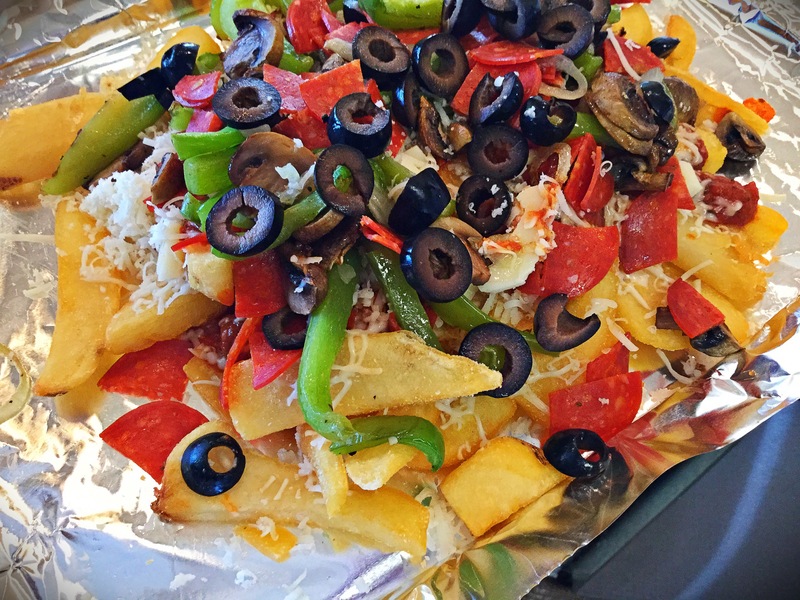 Start this simple recipe by slicing up the veggies, shredding the mozzarella and preheating the deep fryer oil to 350 degrees (or later setting the oven to package temperature if baking the French fries). Set the oven to 400 degrees and line a baking sheet with foil. 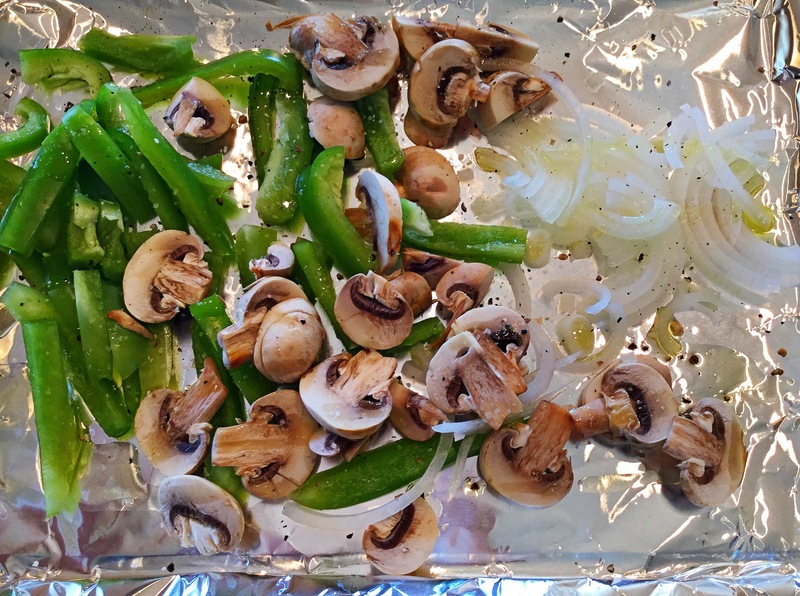 Spread the sliced bell pepper, onion and mushrooms out evenly on the baking sheet and drizzle with a bit of extra virgin olive oil and a pinch of salt & pepper. Place the vegetables into the oven for about 10-12 minutes, mixing occasionally. 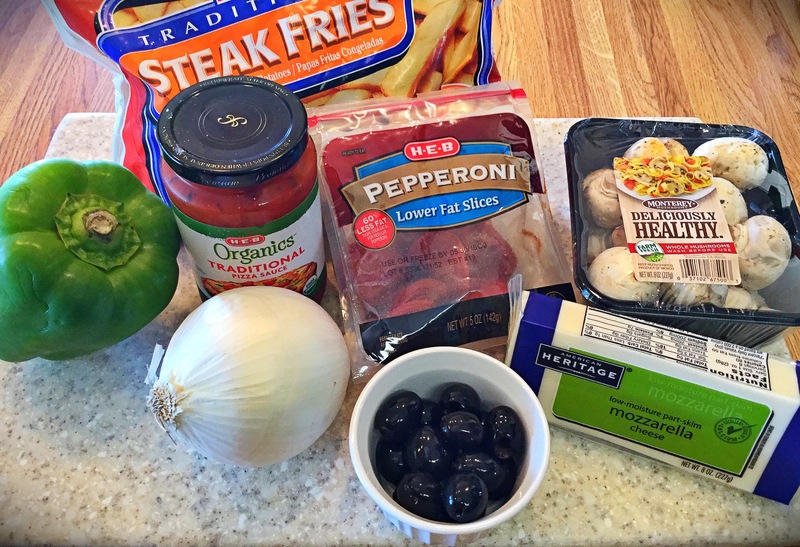 Remove from oven and set aside…keep the oven on. 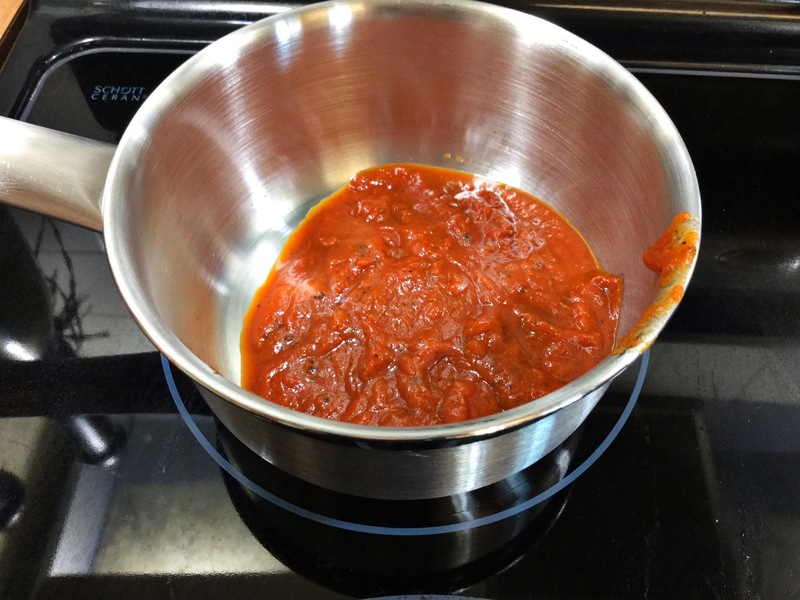 While the vegetables are roasting, pour about a cup of the pizza sauce into a small pan and bring to a low simmer to warm through. Once the oil (or oven) is ready, begin cooking the French fries. You want the fries to be on the crunchy side, so I like to double or even triple fry here. Not burn them of course, but just get them nice and crisp. Remember, you’ll be pouring on pizza sauce, cheese, etc..soggy fries are no bueno! After the fries have finished cooking, toss with a bit of garlic powder (this really helps with that pizza crust flavor!). Assembly time!! On a foil lined baking sheet, add that mound of fries. 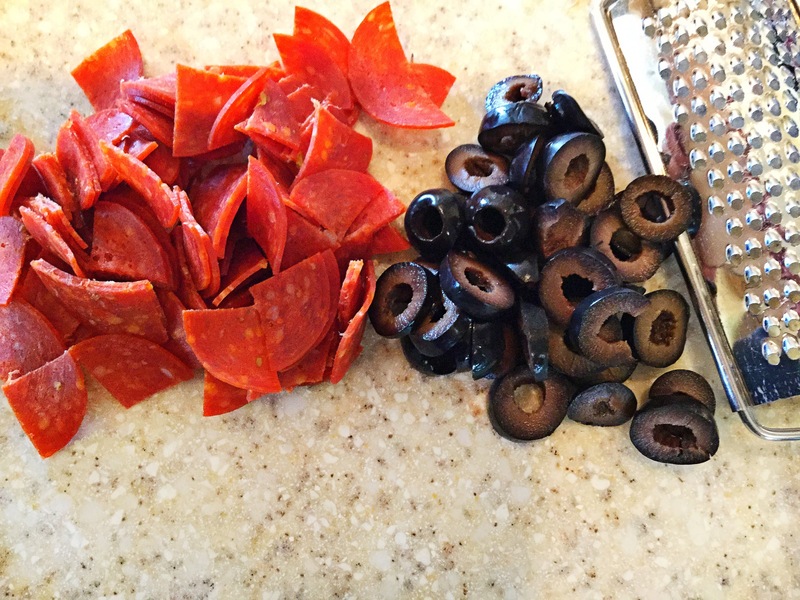 Next, pour on the warm pizza sauce, the shredded mozzarella, roasted veggies, pepperoni and black olives. It’s quite the heaping helping here! Pop into the oven on the top rack (now set to broil) and watch closely as the cheese melts to that ooey-gooey pizza cheese consistency! After just a couple minutes remove and serve up! Heck, I won’t tell if you even eat straight from the baking sheet! 😉 Serve with a bit of crushed red pepper flakes and parmesan cheese if desired.